Visa Shanmugan will lead a workshop on 6 Mindset Secrets to Succeed as a Solopreneur. You started your business with passion, excitement and huge dreams. It started as a side gig and was one day, maybe meant to become your main gig. Or it is your main gig and things are going OK, but you haven’t achieved the full potential yet. Or things are going extremely well, but the business is all consuming. No matter which category you fall under, every spare minute you have is spent thinking about it, driving sales, networking, marketing and hustling. Though you love this business, it’s starting to feel like you are never going to “get there” or you wish you could get there faster. What is it that you are missing? What is it that no one else is telling you? What is the secret ingredient? Visa Shanmugam is a mindset transformation coach who has worked in the corporate world and built successful businesses. After much trial and lots of errors, she realized that mindset is the missing piece in every business owner’s journey. 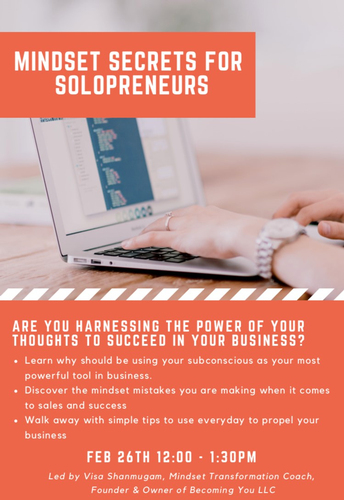 She will discuss the most common mindset mistakes that business owners make, which gets in their way of building a profitable and fulfilling business. Your subconscious mind is your most powerful tool when it comes to business and life. It’s at work all the time, regardless of whether you pay attention to it or not. Attend this 90-minute workshop and learn simple tools and strategies that have the power to completely transform you and how you operate your business.